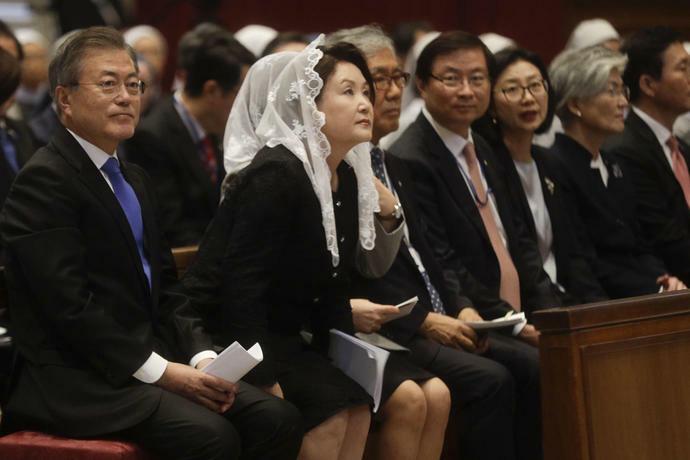 South Korean President Moon Jae-in delivers a speech at the end of a Mass for peace inside St.
South Korean President Moon Jae-in and his wife Kim Jung-sook, second from left, sit inside St.
Vatican Secretary of State Pietro Parolin, right, listens to South Korean President Moon Jae-in delivering a speech at the end of a Mass for peace inside St.
Vatican Secretary of State Pietro Parolin, left, and South Korean President Moon Jae-in to prepare to deliver a speech at the end of a Mass for peace in St.
South Korean president Moon Jae-in arrives in St.
South Korean President Moon Jae-in, right, sits inside St.
A South Korean presidential security guard walks in side St.
Nuns take a souvenirs picture inside the St.
VATICAN CITY (AP) - South Korea's president said he was certain peace could be achieved on the Korean Peninsula as he prepared for an audience Thursday with Pope Francis where he's expected to extend an invitation from North Korean leader Kim Jong Un for Francis to visit. 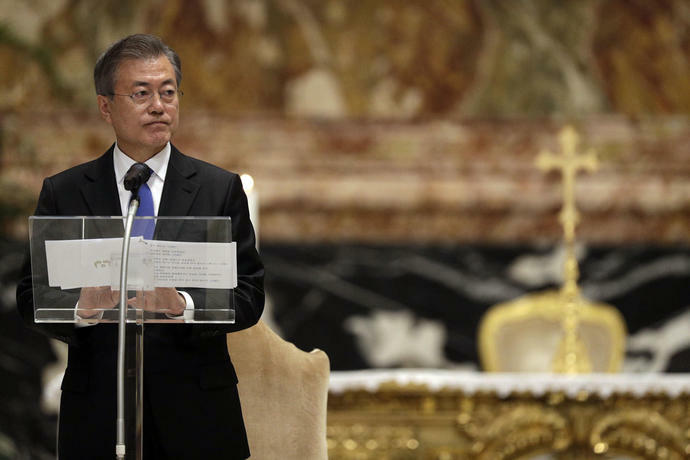 South Korean President Moon Jae-in delivered remarks at a Wednesday evening "Mass for Peace" in St. Peter's Basilica. 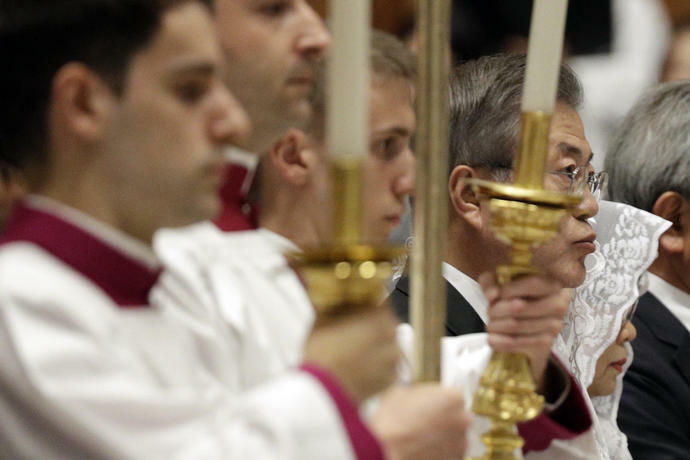 The pope's top diplomat, Cardinal Secretary of State Pietro Parolin, celebrated the Mass. 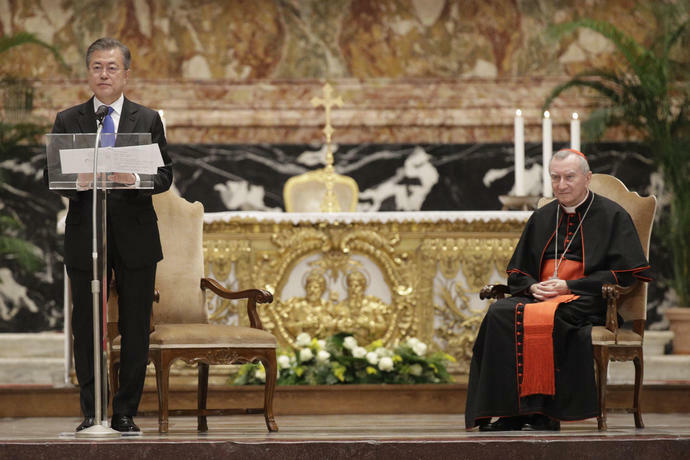 In his homily, Parolin prayed for the "gift of peace" on the Korean Peninsula so "after so many years of tensions and division, the word 'peace' can ring out fully." Moon spoke at the end of the service, saying the prayers offered there "will also resound as echoes of hope in the hearts of the people of the two Koreas as well as the people of the whole world who desire peace." "Our prayers today will turn into reality for sure," the South Korean leader said. "We will achieve peace and overcome division without fail." Moon signed a broad agreement with Kim last month meant to reduce military tensions on the peninsula. Moon's office has reported that during their summit, Kim said the pope would be "enthusiastically" welcomed in North Korea. Moon also had an important role in setting up a June meeting between Kim and President Donald Trump that took place in Singapore, where they announced aspirational goals for a nuclear-free peninsula without describing how and when it would occur. "Just as your holiness prayed before the U.S.-North Korea summit, we are paving a desirable way toward assuring a peaceful future for the Korean Peninsula and the world," Moon said. "The history of mankind has been marked by the embarrassment that is war. The signing of an end of war declaration and a peace treaty in the Korean Peninsula would dismantle the earth's last-remaining Cold War regime." 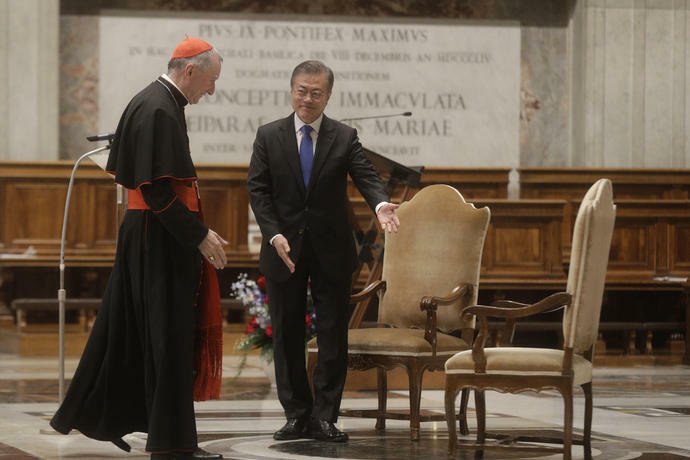 In an article that appeared in the Vatican newspaper, L'Osservatore Romano, Moon praised Francis for his promotion of dialogue and said he hoped the Korean peace initiative could help the Vatican forge relations with the North. 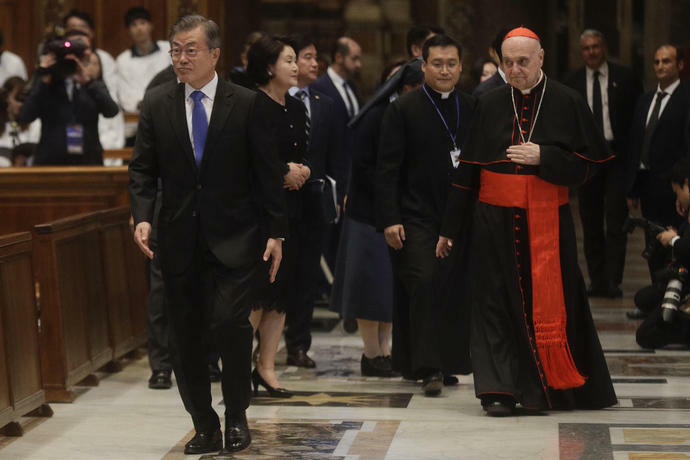 Moon, who is Catholic, wrote that when he traveled to Pyongyang in September for the summit, he was joined by a Korean Catholic bishop to try to improve relations between the church in North and South. 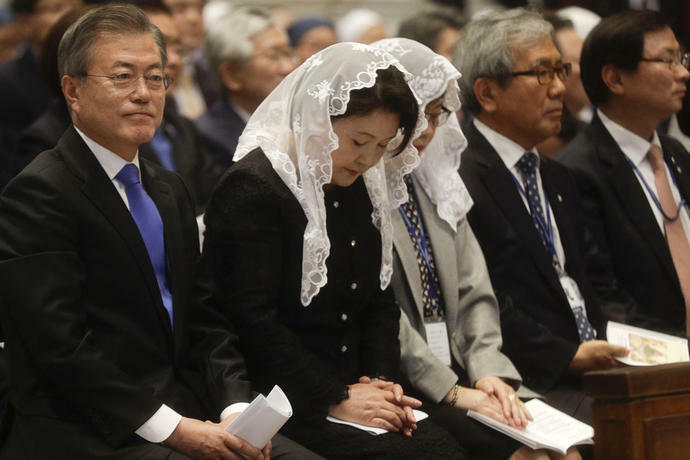 "In recent months, the pope's prayer and blessing have given the Korean people great encouragement and hope on the path to peace," Moon said. North Korea strictly controls the religious activities of its people, and a similar invitation for then-Pope John Paul II to visit after a 2000 inter-Korean summit never resulted in a meeting. The Vatican insisted at the time that a papal visit would only be possible if Catholic priests were accepted in North Korea. Francis, however, has taken a less-absolutist approach in the Holy See's diplomacy, as evidenced by a recent deal over bishop nominations signed with China, North Korea's closest ally. Previous popes refused to cut a deal with China's communist leaders, who allow religious practice only in state-sanctioned churches. 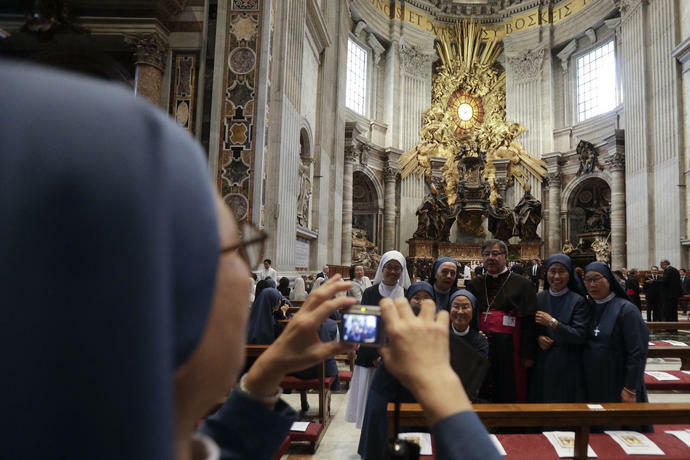 The Vatican's priests were expelled by North Korea long ago and state-appointed laymen officiate services. 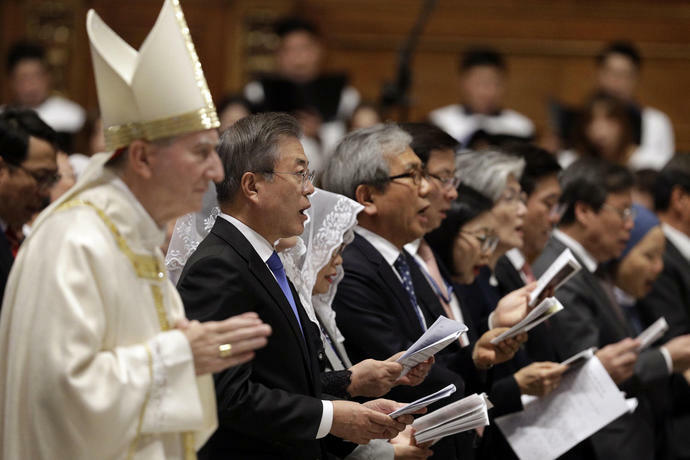 Estimates of the number of North Korean Catholics range from 800 to about 3,000, compared to more than 5 million in South Korea. Following an unusually provocative run of weapons tests last year, Kim has been on a diplomatic offensive, which included three summits with Moon and the one with Trump.